My name is Jay Arrington and I am the Head of a Special Education Department at Monarch Park Collegiate. Our Department supports students with Physical and Intellectual Disabilities, including students with mild Autism all the way to those in the profound Autism range. Earlier this year, in December, our department hosted their 14th Annual Holiday Arts & Crafts Sale, which raises money towards a shared Holiday Party and for donations to different areas of our school. Every year we work hard to provide augmentative supports in place, for students to use to help them connect with the customers they encounter during that sale, and have been able, with limited success to provide some limited materials, like symbol and word icons, photos, etc. ; however as we annually have somewhere in the neighbourhood of 15 to 20 products, which the students produce towards this effort, we are often far too busy to create an aid for each price and sometimes only able to make a scant few. Instead we are often forced by these time constraints to rely on Person centred supports to act as mediator or supports to help most of our students to stay connected to the experience. we always managed to have a fun and successful sale, but many students were very dependent on staff to complete the experience. This year though we used MyVoice with an iPad and all that changed. Using an iPad and the MyVoice app was remarkable for us for a number of reason. Firstly, I was blown away that we were able to take photos of each and every product, attaching the titles to each photo, using the iPad camera to bring those images right into the MyVoice program, ready for the students to use in less than 10, or 15 minutes – and I’m talking about 20 some odd products. If we had used traditional augmentative aids with the symbol and word picture….well it would’ve taken us countless hours to create them and cut them, and laminate and velcro these images, or to take photos in the same process. It was amazing to me, as a teacher in Special Education for the past 22 years, to see such a convoluted process become so accessible, immediate and useable by students so unbelieveably quickly. In less than 15 minutes we were able to lay out the products, take photos, add words, save that work and have it ready to use. We went out to our sale and let students take turns using the iPad to communicate with customers, answer questions about products and their prices with minimal or no support from staff. We as staff were truly and deeply impressed by the portability of the iPad and the ease and simplicity of the My Voice app for staff to use, but also that it was easy and accessible for the students; and the students were moved and excited by the independence they experienced with it. 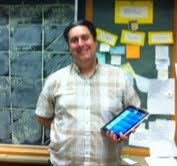 Students came back excited and, in two instances, asking to get to use it again…wanting an iPad of their own. It was also exciting for customers who were excited to be able to connect with our students directly, to be able to interact with them without intervention from staff. I am so excited by this technology and thinking and all that it will mean for people with Special Needs and those Able Bodied people in our communities, each of whom will be brought closer together, with less mediation, explanation, and with a more postive and detailed interaction. Thanks Apple, thanks MyVoice, you are truly coming together to make the world a better place…!!! I can’t wait to get more of the students in my Department using these tools…. !